This is another one which ran in Solidarity. Sometimes liberal Catholics are accused of being “Cafeteria Catholics”, picking and choosing which church doctrines they like. Well, liberals aren’t the only ones guilty of this. Every once in a while, the Roman Catholic Church remembers that it has a long tradition of being concerned with Social Justice. 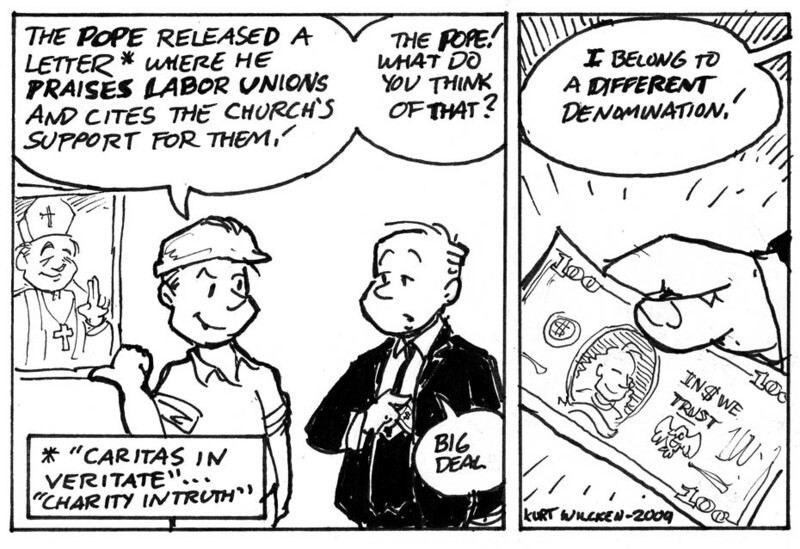 The Pope issued an encyclical letter entitled “Caritas in Veritate” (“Charity in Truth”) re-affirming this tradition, including the church’s long-standing support of trade unions. Conservatives who count the Pope as an ally on social issues like abortion and gay marriage tend to overlook this aspect of Catholic teaching. Of course, being a Lutheran myself, I did this cartoon chiefly because it gave me the opportunity to draw a funny picture of the Pope.